University of Toronto researchers have designed and tested a new form of solid, stable light-sensitive nanoparticles that could lead to cheaper and more flexible solar cells. Researchers in the University of Toronto’s Edward S. Rogers Sr. Department of Electrical & Computer Engineering have designed and tested a new class of solar-sensitive nanoparticle that outshines what we currently consider state of the art. This new form of solid, stable light-sensitive nanoparticles, called colloidal quantum dots, could lead to cheaper and more flexible solar cells, as well as better gas sensors, infrared lasers, infrared light emitting diodes and more. The research, led by post-doctoral fellow Zhijun Ning (ECE) and Professor Ted Sargent (ECE), was published this week in Nature Materials. Collecting sunlight using these tiny colloidal quantum dots depends on two types of semiconductors: n-type, which are rich in electrons; and p-type, which are poor in electrons. The problem? When exposed to air, n-type materials bind to oxygen atoms, give up their electrons, and turn into p-type. 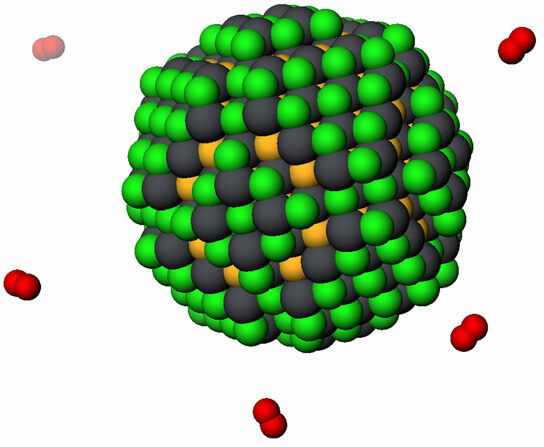 Ning and colleagues modeled and demonstrated a new colloidal quantum dot n-type material that does not bind oxygen when exposed to air. Maintaining stable n- and p-type layers simultaneously not only boosts the efficiency of light absorption, it opens up a world of new optoelectronic devices that capitalize on the best properties of both light and electricity. For you and me, this means more sophisticated weather satellites, remote controllers, satellite communication, or pollution detectors. This research was conducted in collaboration with Dalhousie University, King Abdullah University of Science and Technology and Huazhong University of Science and Technology. Be the first to comment on "Engineers Design and Test a New Class of Solar-Sensitive Nanoparticles"